Share your greatest moments, your way. The SHAREfactory™ app offers easy video-editing tools and effects to let you share your greatest moments, your way. 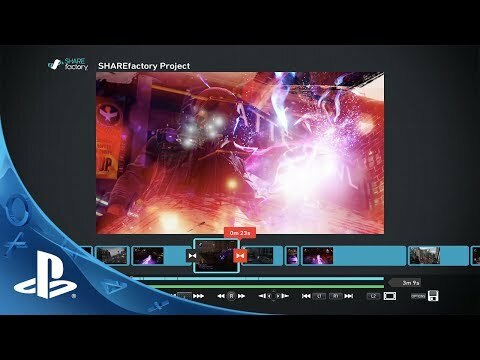 Effortlessly combine, personalize, and share your favorite game footage with your own commentary, a soundtrack (included tracks or your original music), themes, stickers, text, even a picture-in-picture video with the PlayStation®Camera. Once you’ve created your perfect cut, post it directly to your Facebook profile with the touch of a button, or save it to a USB drive and upload your video to the world. SHAREfactory gives you the tools to show everyone your most amazing moments – and make those moments even more spectacular. Effortlessly combine your favorite game footage in minutes using simple, intuitive controls. Customize videos with commentaries, soundtracks (included tracks or your original music), effects, themes, and more. Post your videos directly on Facebook via your PlayStation®4 system or use a USB drive and upload them to the world.